We are the leading manufacturer and exporter of quality hydraulic presses for diverse industries. Our custom design hydraulic presses based on the client's specifications. "Flowmech" offers a wide range of supreme quality hydraulic presses for Melamine Crockery that is used to generate a compressive fornce. These Hot Moulding especially designed for melamine are highly rigid, compact and space saving, bigger ram dia gives uniform pressure on the working platen which increase the quality and productivity of the product. The machines are manufactured using finest quality components and modern technology under the supervision of technical professionals. We are the leading manufacturer and exporter of Upstroking Hydraulic Hot Press. Up Stroking Hydraulic Press offered comprise 150 ton pillar type up-stroking hydraulic press that comes with up-stroke options with bed size of 650 x 600 mm and single acting main cylinder. Other than this these high performance based hydraulic presses come with Main Ram diameter of 320 mm, maximum Stroke of 400 mm and Working Height of 750 mm. Some of its other features include 200 liters of oil reservoir support, 10 HP electric motor, push button based operating cycle and maximum working pressure of 200 Kg/cm². Further we can also custom develop these presses as per the specifications provided by the customers. 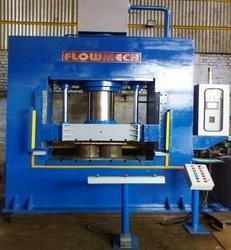 Looking for Hydraulic Press for Melamine Crockery ?